Anyone else out there having a hard time getting back in the swing of things after the holiday break? Maybe it's the holiday break...maybe it's the full moon...maybe it's the many birthday treats we've had this week - who knows! 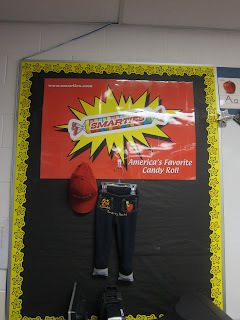 Whatever it is, I needed something to motivate my 2nd graders to work on their behavior...pronto! I came up with this "Snowman Surprise" to help. Each time the class is making good choices as a group, I'll ask a student to add another piece of our snowman. When the whole snowman is put together, they will earn a Snowman Surprise!! It will be things like a prize from the prize box, a day of comfy toes (everyone can work with their shoes off! ), 5 minutes of extra recess time, etc! Phew! The past 2 weeks have been a little crazy. Two weeks ago I had jaw surgery, and was totally out of commission for the entire week. Luckily I knew in advance about the surgery and was *almost* ready for the first day of school. Almost...I still had to spend one afternoon/evening when I wasn't feeling so hot camped out in my room getting ready for my little ones! View from the door. I just love my seat pockets from Carson Dellosa! Not sure what we would do with all of our binders (Poetry, Writing, STAR Binders, and Math Binders this year thanks to Cara over at The First Grade Parade!) without our seat pockets. View from the other corner of the room. Our cubbies and the Theme & Genre wall. 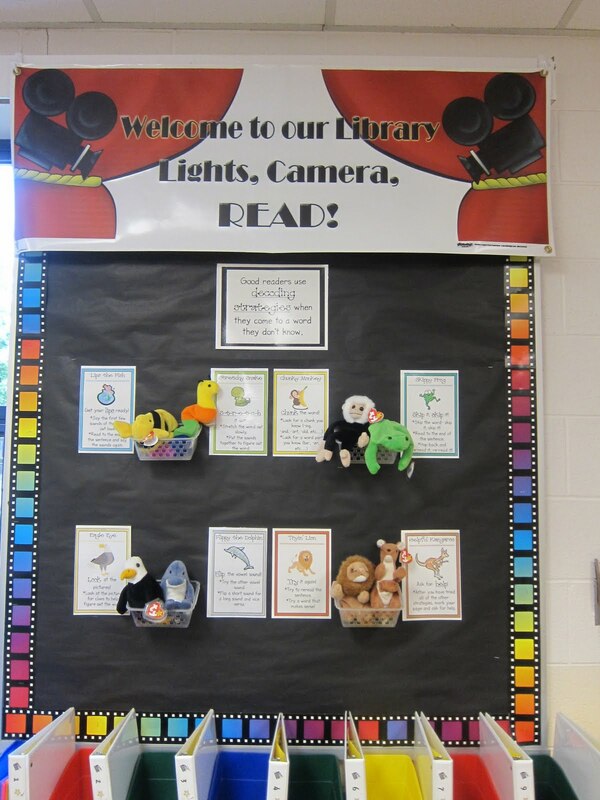 I add photos of the stories we've read underneath each Theme or Genre category throughout the year. Celebrity of the Week pocket chart and our Classroom Jobs pocket chart. I got the job cards from Teacher's Clubhouse! 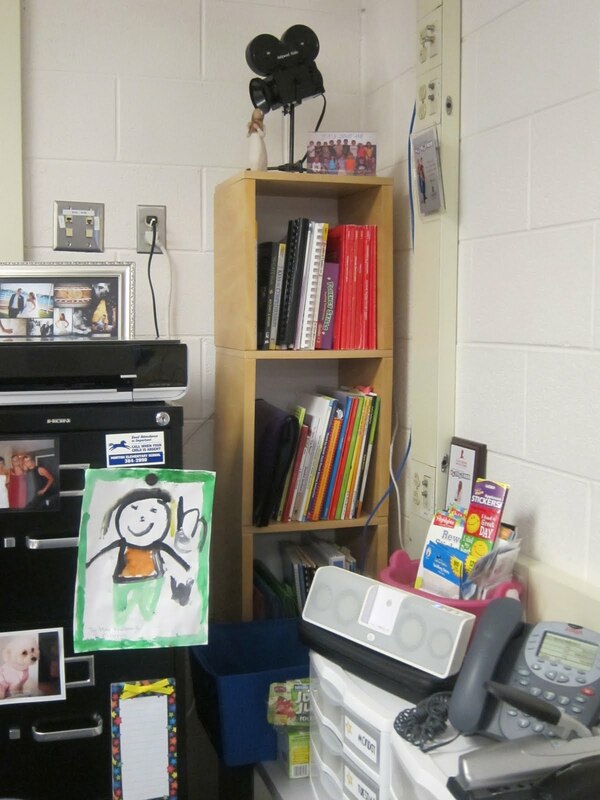 Our classroom library - the gray Massage Chair is definitely one of my students' favorite spots in the room! They can choose the "Sit in the Massage Chair" coupon from the Prize Box on Friday if they'd like to sit in it during Daily 5. Our Beanie Baby strategies. 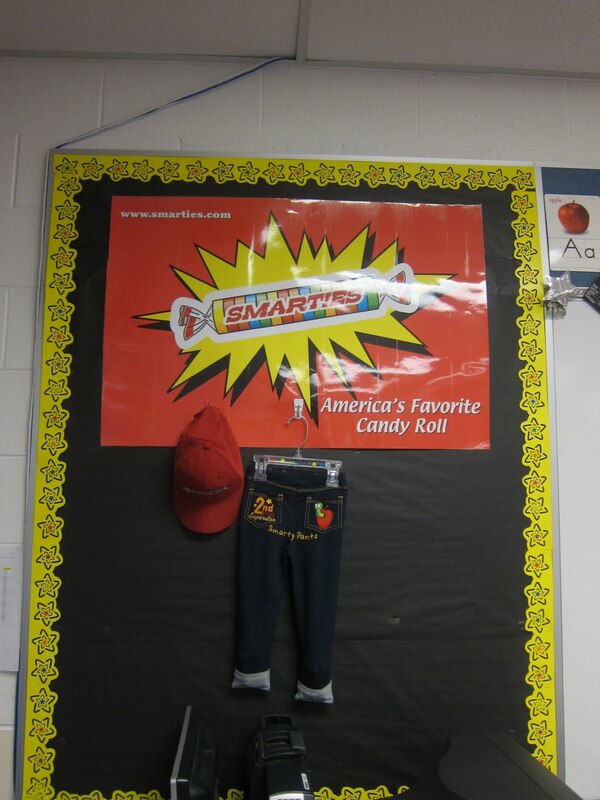 I have seen so many cute bulletin boards with Beanie Babies displayed on them. Call me crazy, but one thing I could NOT do was stab the little Beanies with push pins to hang them up! It just seemed wrong! 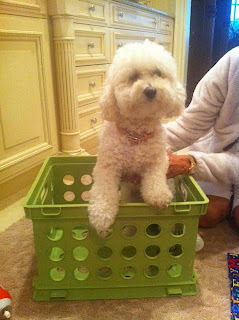 So I put them in these little baskets instead. :) We take them down one at a time as we are learning about the strategies. Student book boxes from Really Good Stuff, and reading binders modeled after Beth Newingham's. Some of the fiction and non-fiction book baskets. Books are organized by theme or genre. They have a small label on the inside which matches the label on the basket. I forgot to take a picture of that! More fiction and non-fiction book baskets. 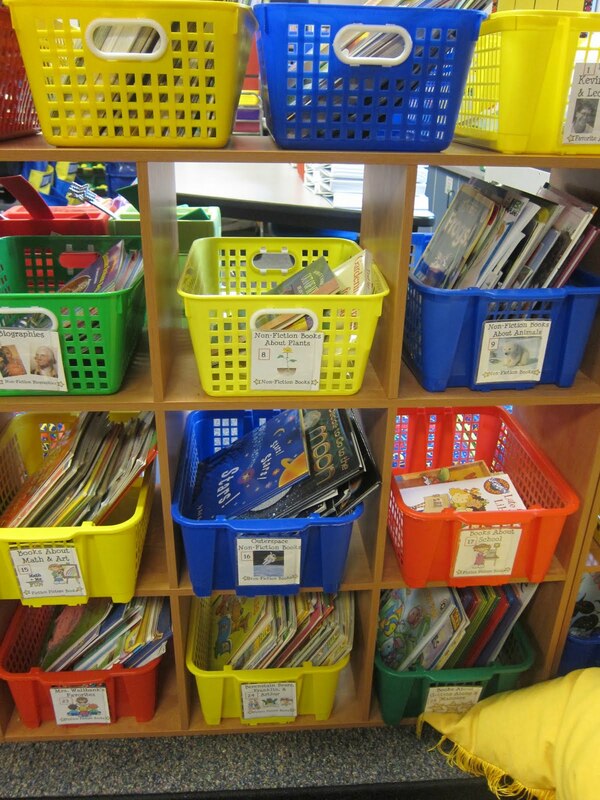 Book baskets are also numbered to help students find where a book goes more quickly. 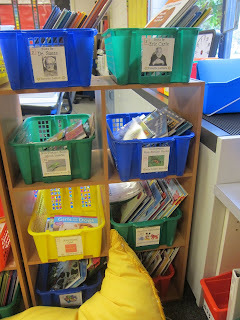 Some of our favorite authors and more fiction/non-fiction baskets. On the top right, we have our classroom magazine subscriptions (American Girl, Highlights, and National Geographic for Kids). Underneath that are some of our chapter book series including A to Z Mysteries and Magic Treehouse. More chapter book collections! 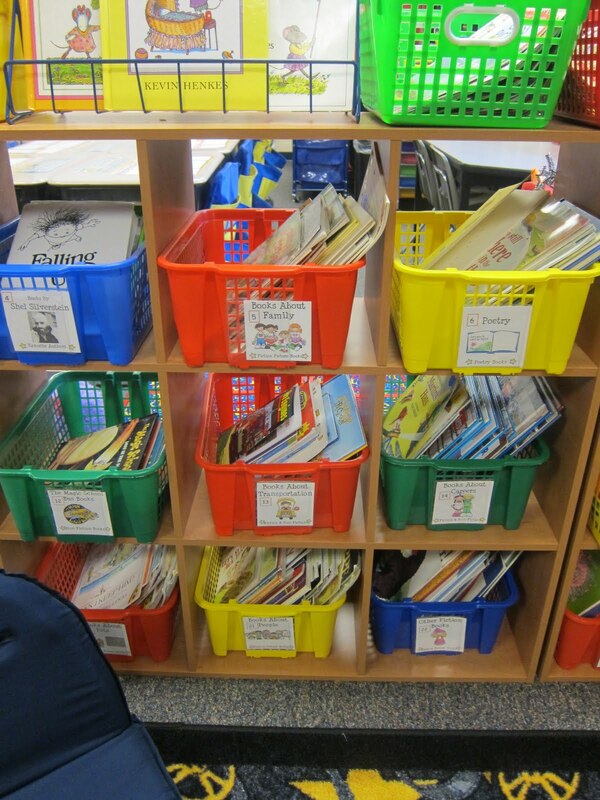 I had to re-do these baskets (and add quite a few more) this summer because my chapter book collection keeps growing! I love Scholastic Book Order Bonus Points! 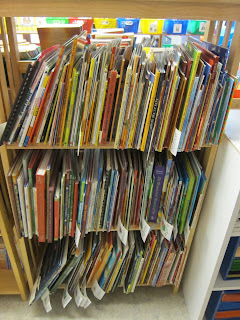 Our book display holds monthly books. I rotate them out every month to keep things fresh and exciting for my readers! These are our September Back to School books. These are my Literacy Bags that I created through a grant from Donor's Choose. Students take them home every Thursday to share with their family. 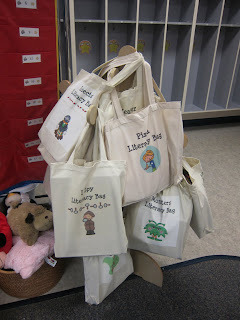 They are centered around a theme and contain several books, a game or activity, and a notebook to write about their experiences with the bag. You can read more about them here! This year I am trying something new! 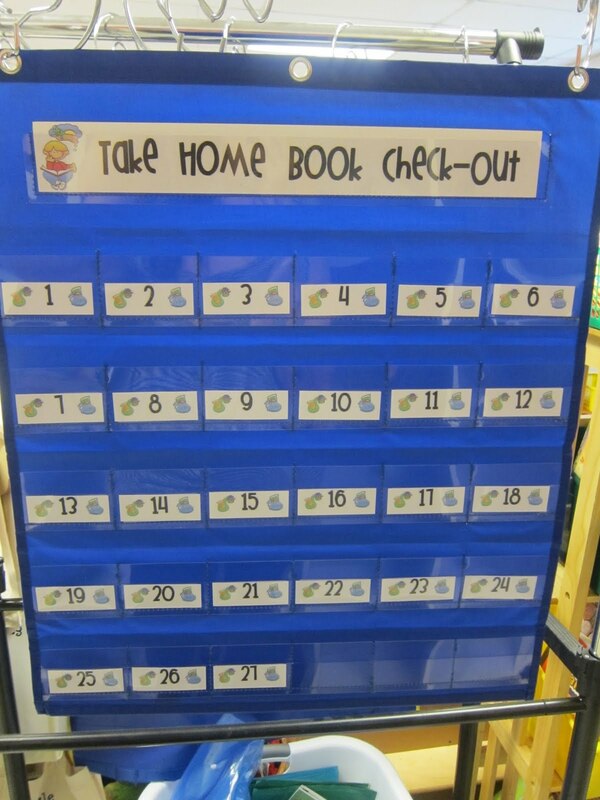 Students are going to check out a book each day to take home for their nightly reading homework. This is the chart where they will place the card from inside their book so I know who has what. Here are the Take Home Books. They are not completely ready yet, as I need to label the boxes with different levels. 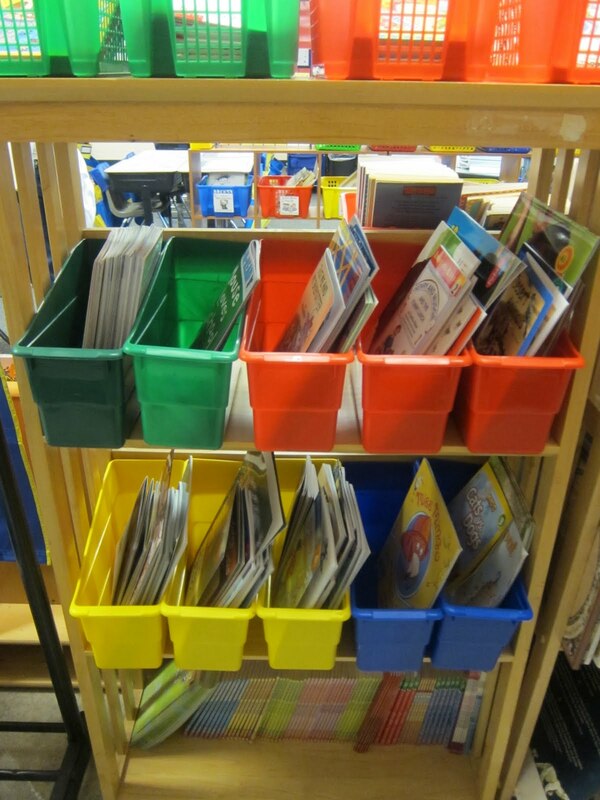 These books are organized by level only. Each student will be required to take a book home at their exact level. This is my personal bookshelf. 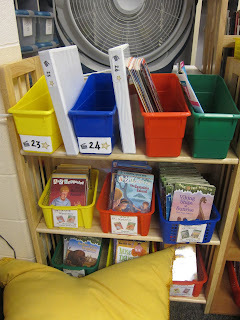 It is where I keep my monthly books to put in our book display, or other books I use to teach with. 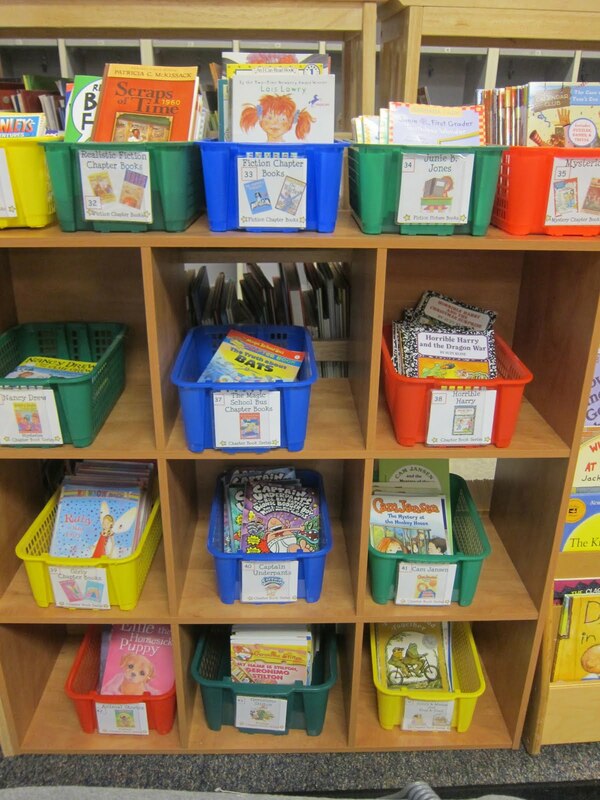 I like to keep some special books put away so they are new and exciting for students when I teach a lesson with them! View from the back of the room. 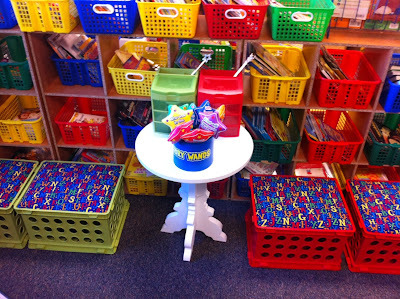 Star Reader chairs to use during Daily 5. Our writing table, shelves, and crate seats. 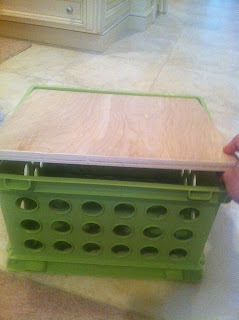 The top on the crate seats lift up, and I plan to keep Daily 5 writing materials inside! 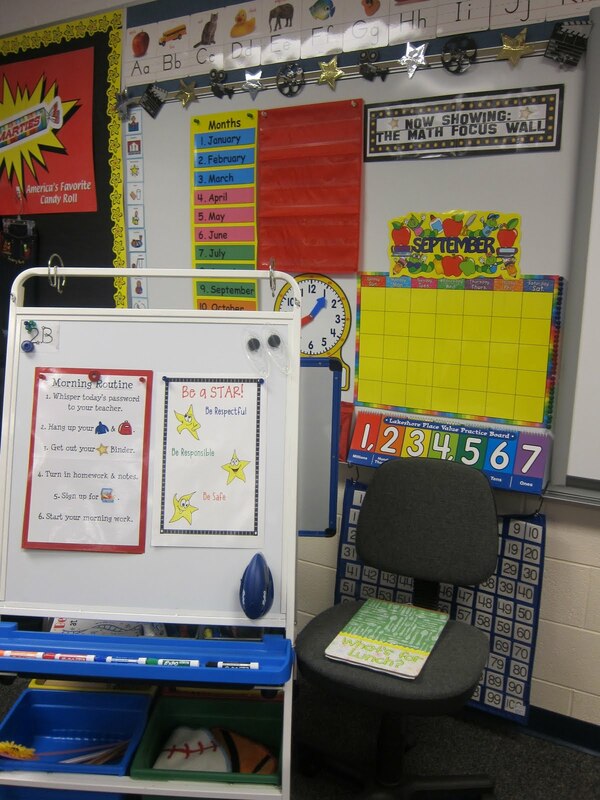 Our math meeting area, along with my easel. I also just made that clipboard for our daily lunch count - it was my first experience with "Modge Podge"! Our Jitter Juice stand! 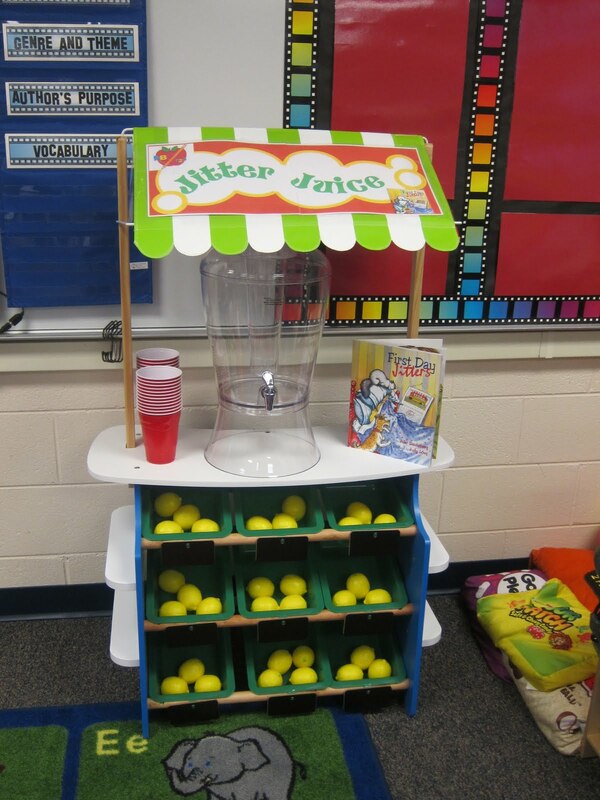 We used this to make our Jitter Juice on the first day of school. 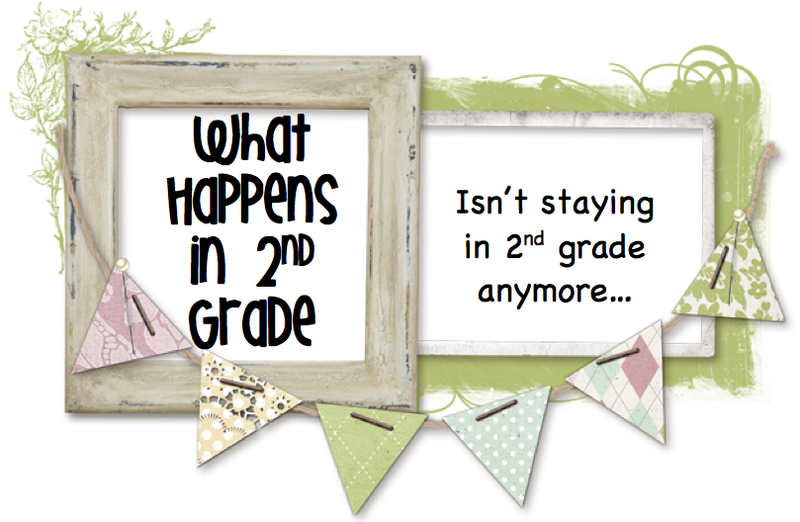 I got the idea from Abby's adorable Back To School Unit! Reading Focus Wall and CAFE menu. A monthly poem will be displayed in this pocket chart. On top is our Work on Writing basket of activities, Word Work basket of activities, and Listen to Reading i-Pod books. Listen to Reading nook...complete with movie candy pillows! My desk...wouldn't be complete without a large Diet from McDonalds in a styrofoam cup! Area behind my desk. 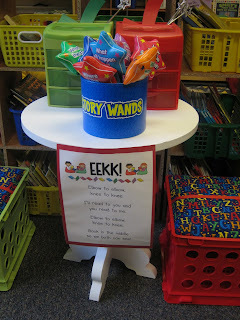 The sweet teachers in my school introduced me to this drawer system for filing my papers each week. I love it! There is one drawer for each day of the week, and one drawer for "extras". It keeps me so organized. My friend and colleague Molly had the idea to use this wasted space in the corner by getting this bookshelf from Target! I use it for teaching books that I don't need access to all the time. The Read to Someone table, complete with a cute little poem that I "borrowed" from Amanda over at One Extra Degree! Here are the crate seats again. I picked up these stuffed animals at Kohls for $5, and they included a hardcover book! Great deal. ...and the back is math. Love them! Well, that's about it! 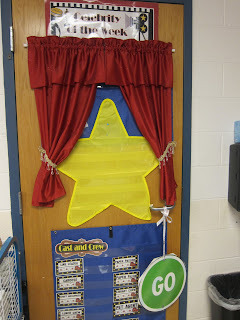 I will be posting soon with photos of my 2nd Grade Writing Menu and another writing display that I am working on! I hope everyone enjoyed their summer vacation! I know I did! Our summer was FILLED with fun events from weddings to parties to vacations, etc! We were very busy, so I apologize for the lack of posts. I have recently become addicted (like many of you!) to Pinterest. If you haven't checked it out yet, head right over and sign yourself up for an account! Pinterest is an electronic pin board that allows you to "pin" any image you see on the Internet to your account. 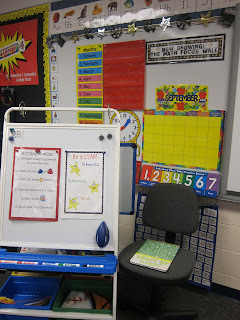 How many times have you seen a cute teaching idea on a blog or website, but then can't remember where you saw it? Well Pinterest can solve that little problem for you! 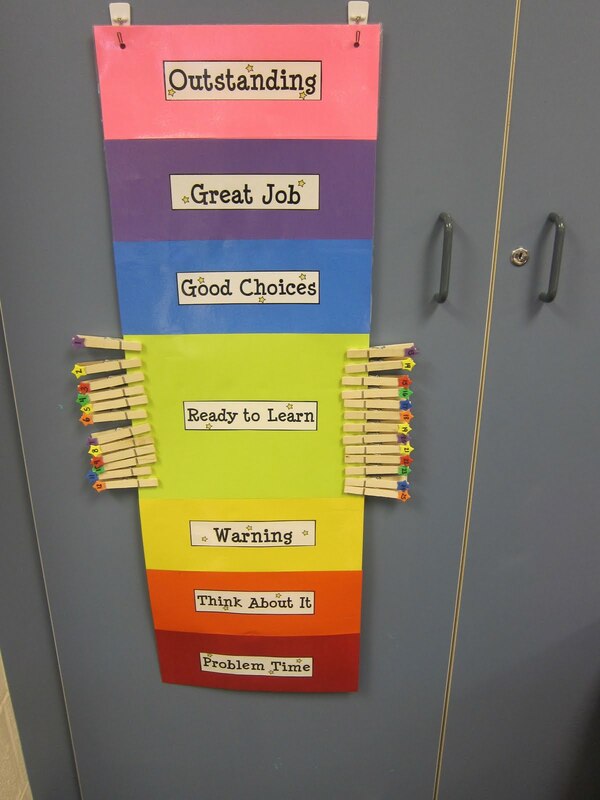 Just pin it to your "For the Classroom" Pin board and it's right there waiting for you! So I just had to have one! And one quickly turned into SIX! 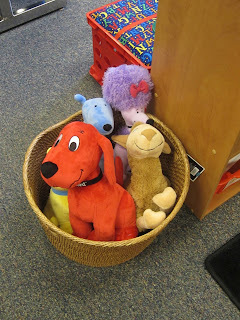 I decided to use these adorable little seats for our new "Read to Someone Nook". 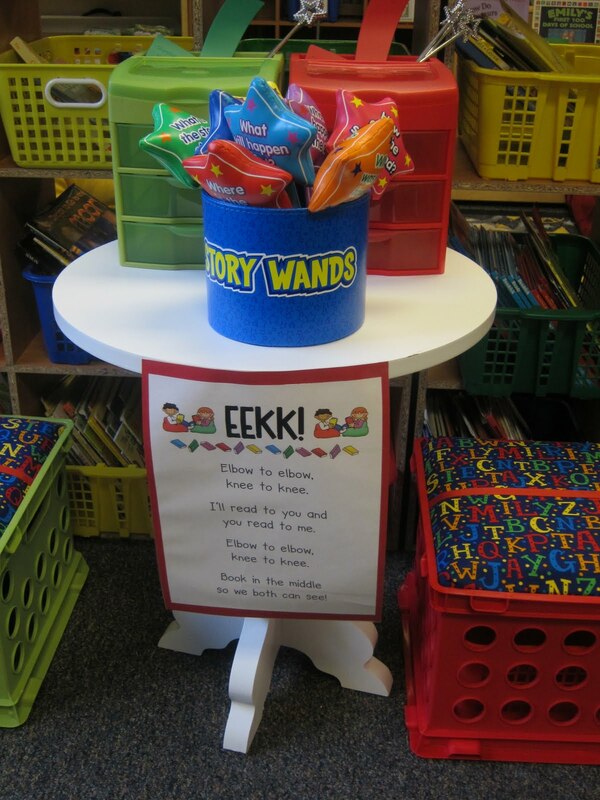 My 2nd graders will be able to sit on these special seats when they choose to Read to Someone during Daily 5. Here's how I made mine! 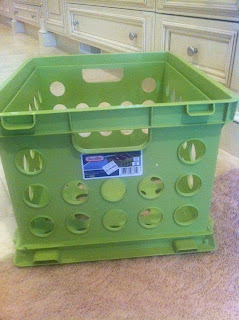 I started with these file folder crates from Wal-Mart. They were only about 3 bucks, and came in a variety of fun colors! My brother-in-law Mike (who is a carpenter) was kind enough to cut these pieces of wood for the top of the crate. It fits right into the inside lip where file folders would normally hang. I was planning to go to Lowes to buy the wood and ask them to cut it for me, but holy smokes - have you ever been down that aisle in Lowes? There are a LOT of choices. Luckily Mike came to my rescue and cut the wood PERFECTLY for me - he even rounded the corners so it would slide right in! Thanks Mike!! 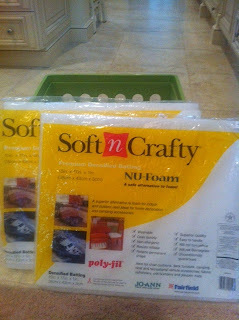 I got the padding for the top of the seats at JoAnn Fabric. These were a bit pricey, but to be honest, I didn't shop around too much. 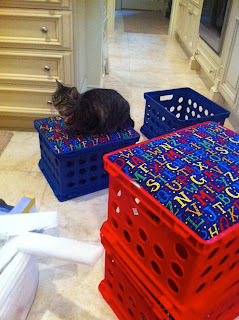 I am sure there is a more creative, cheaper way to pad the seats! I glued the padding to the top of the wood using a spray adhesive. 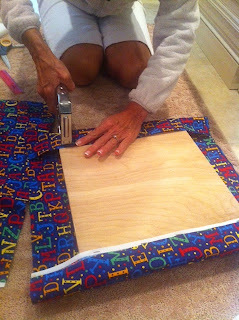 Then my mom helped me use a staple gun to staple the fabric tightly around the seat cushions. It was helpful to have two people since you need to pull the fabric tightly. The corners were the toughest part - that took some trial and error! And that was it! Even my parents' cat Libby thought they were pretty comfy! I can't wait for my new 2nd graders to use their comfy seats! Not only are these cute and cheap, but I love that the inside also provides storage. You can just lift off the top seat part and the inside is all yours! 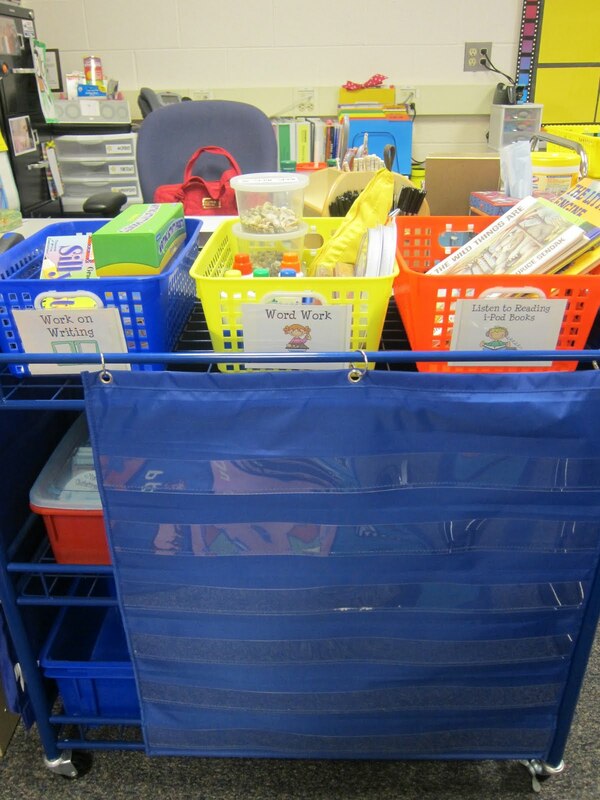 I am not too sure what I'll even keep in there yet, but you know you can ALWAYS use extra storage in the classroom. In case you are wondering, I found that cute little white table at Home Goods! I thought it would be perfect between the two sets of partners. 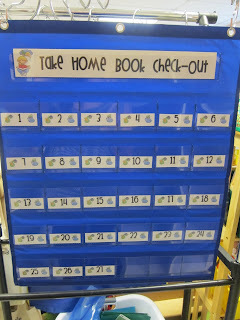 It will hold their "Check for Understanding" Check Marks, story wants to use when reading with their partner, and other partner reading activities. 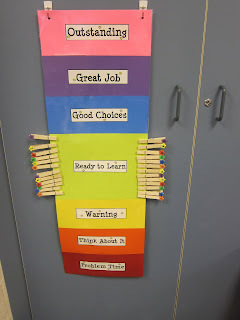 Thanks to Pinterest and What the Teacher Wants for this cute idea! I am a 20-something wife and 2nd grade teacher expecting my first baby! This blog will explore the journey to motherhood through the eyes of a diabetic mommy-to-be. Thanks for stopping by!